There is a kind of synergy in the landmark rulings from the Supreme Court over the last two days. After all, the Defense of Marriage Act and Proposition 8 singled out a particular group for special exception from a legal institution and the Voting Rights Act singled out a particular group for special protection under the law. 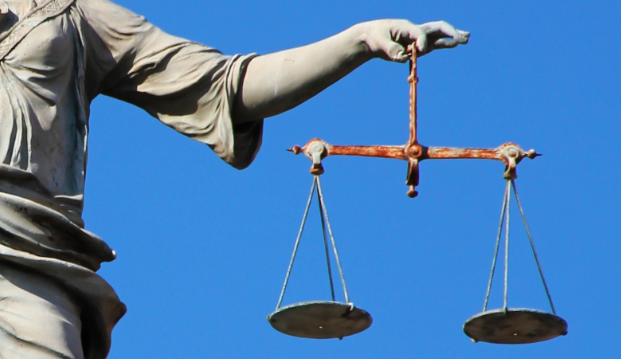 There is a kind of long view where one might convince oneself that a just society should have laws that targeted no particular group for either penalties or privileges. Of course, the difference is that DOMA was a means of discrimination while the VRA was a tool for preventing it. That’s a crucial distinction, and the ruling here says a great deal about the disconnect between where we want to be as a society and where some sectors of society have convinced themselves we already are. Statistics consistently demonstrate persistent bias in the system against minorities in this country, and that poverty and injustice are often most pronounced in the very region targeted by the VRA. Incarceration rates and graduation rates continue to testify to the failure of our society to promote a truly egalitarian culture that allows all its citizenry equal access to the opportunities of the American Dream. Yet, the justices for the majority on the VRA ruling seem to think the time for corrective structures in our society has passed–that the system has done all it can to repair the historical legacy of slavery, Jim Crow, and all the other wellsprings of our nation’s persistent racism. No special protection required. I wish we did live in that America. But far from inaugurating a post-racial era, the election of America’s first black president has brought much of its lurking racism to the forefront. In light of recent efforts at voter disenfranchisement throughout the country, the justices for the majority are guilty of, at best, hopelessly wishful thinking–if not willful, politicized neglect. It’s curious that the justices chose what is now, more and more, considered the “right side of history” in the debate about gay marriage and the place for homosexuality in our culture, but on access to the ballot for all Americans, they came down almost simultaneously on what’s been the wrong side since the 1950s. If this paradox is not political, if the justices truly believe justice is best served by removing systemic protections for minority enfranchisement, then it seems that they have stepped into the twenty-first century on the issue of gay marriage, and are looking forward into the twenty-second century on race relations. That’s an America I’m sure we should look forward to, but I don’t think this is how we get there. Tonight, watching Chasing Ice with my family, I was treated to–and participated wholly in–an alternating series of breathless exultations at unimaginable natural beauty and horrified gasps at the scale of global climate change’s impact on the planet’s ice caps. Photographer and leader of the Extreme Ice Survey James Balog produced the documentary as the culmination of his team’s work documenting, in real and visceral images, the deteriorating glaciers in Greenland, Iceland, and Alaska. The damage already done to Earth’s glaciers is startling. My daughter, again and again, wondered aloud how anyone could doubt the impact of global warming. Indeed, I defy anyone to see the images Balog collected and deny the reality of climate change. But, I suppose, some might still be able to accomplish such a feat. As I explained to my daughter just moments after the credits rolled, we have had this mythology in our culture for centuries that we human beings are thinking beings first and foremost, but in reality, we are merely believing creatures. Dishonest media outlets like Fox News and their blowhard talking heads like Rush Limbaugh have denied the scientific consensus so vehemently at the behest of big business–like the oil industry–that doubt and misunderstanding has spread like waves through the public, leading to the ironic drop in credulity about global warming even as the evidence has mounted exponentially. Too many people are slaves to their ideologies, unable to break free from partisan filters and politicized bubble realities where anything that doesn’t conform to their accepted narrative must be negated. Such will be the cry from the right wing next week when President Obama announces a new offensive on “carbons pollution.” The carbon in question, of course, is carbon dioxide. Natural, and essential for life, CO2’s share of our atmosphere has risen precipitously in the last century. Studies of Venus’s runaway greenhouse effect first alerted us to the danger of such gases like methane and CO2 building up in our atmosphere and trapping heat (methane is many times more powerful, but CO2 lasts longer in the atmosphere). If President Obama really wants to sway the nation to his side–to the side that holds dear all our future generations–then he should simply play some of the time lapse videos Balog assembled. The right wing has fought this battle with emotion and prejudice. Facts and reason won’t sway them, but seeing a glacier the size of Manhattan break apart and drift into the sea just might. We’re bad about changing our beliefs, but reality demands it–if facts and evidence don’t convince people of that reality, then maybe images will. For my part, I have always believed that human arrogance is what has almost ruined the world and that more hubris was hardly the recipe for repairing it. That is why I have always opposed countering global climate change by deliberately tinkering with the atmosphere further. Now, though, I see that we have no choice any longer. I don’t want to use the word “hope,” but I will go so far as to say that President Obama should include some plan for carbon sequestration in his proposed assault on CO2 levels. To our great shame as a species, we must now try to not only reduce our CO2 emissions, but actively pursue technologies to leech it from the air and store it. The enormity of the problem demands extraordinary action. We should have begun massive reengineering of our fossil fuel addicted society twenty years ago, but we did not. Our descendants will curse us for our short-sightedness, but at least if we take real steps now–by reducing and sequestering carbon–then they will not be able to say to us that we did absolutely nothing in the face of a clear global threat. James Cameron is a gifted film-maker. Now, let me parse that statement. He has gifts–not necessarily all the gifts you’d want him to have, though. For one thing, he can’t write a three-dimensional character to save his life. Sadly, his plots are seldom terribly intricate either. He makes up for these deficits with an ingenious sense of just what is possible on screen–of sensing the outermost boundaries of what can be done. The way these strengths and shortcomings play out in Aliens is interesting, to say the least. Forget what people say about Titanic or Avatar, Aliens is Cameron’s masterpiece. The plot may be little more than “forty miles of bad road,” but the trip down that road is so well constructed with so many threads of conflict woven into it that as the road gets rougher, the knot of tension is twisted ever tighter. I could go on and on about this–in fact, I did once in an extensive analysis for grad school. Enjoy! As I said before, character development is not Cameron’s strong suit. In Titanic, for example, Rose is only tolerable because of the admirable (and Oscar-worthy) efforts of Kate Winslet; whereas DiCaprio’s Jack just plain isn’t. Avatar’s leads and bit players, like most of Cameron’s characters, might as well be card-board cut-outs. Obviously the most important characters in Aliens come to Cameron through the original Alien film, but to his credit, his script enhances both Ripley and the monster. In the first film, we knew Ripley was a determined and hard-nosed officer, but the iconic heroine was still lurking beneath the surface–waiting for this sequel to be revealed. Between the greater range for the character in the script and Weaver’s more refined acting chops, Ripley becomes the model for strong female protagonists in genre filmmaking. One wouldn’t exactly call the rest of the characters a subtle ensemble cast, but each of their somewhat flat personas serves the intertwined conflicts of the plot more so than in most of Cameron’s other films–where bad guys always sneer and simper from frame one and there’s never anything resembling ambiguity. Through Ripley, each of these characters finds his or her moment–Hicks learns leadership, Hudson courage, Gorman sacrifice. These are through-lines missing in later works like Avatar, but which weave into the central conflict much more efficiently than, say, the robot-gets-a-soft-side nonsense in T2. 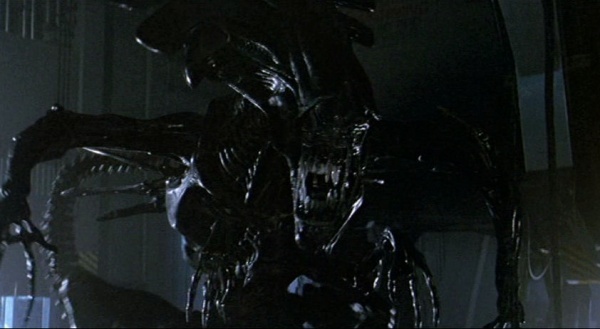 In my review of Alien, I noted that the celebrated monster itself is more fully realized in Aliens than in the original. This is, obviously, near sacrilege to geekdom, but I’ll explain. In Alien, the creature moves slowly, plodding like Jason with a machete, counting on the co-eds to stumble in the woods. In Aliens, though, Cameron brilliantly reimagined the monsters–giving them a lithe agility as they hop around corners, squirm through crawlspaces, and emerge from the walls of their hive. Then, of course, is the queen herself. As he wrote the screenplay, Cameron had to doubt that she was even possible. In later Alien films the creature has been rendered using CGI, the silly putty of today’s special effects. In 1986, though, the queen was real. She existed. A towering monster that lived in the space with the actors and heightened the terror of the already terrifying alien creatures. Cameron began in special effects, and throughout his career his films have made bold, loud moves into previously unknown territory in visualizing the impossible. From the water snake in the Abyss and the T1000 in T2 all the way to the world of Pandora in Avatar, many of these celebrated accomplishments in film making have involved computer imagery. Aliens, though, represents his greatest accomplishment. All of its considerable visual feats are created with practical effects. The queen was fantastic as a giant, four-man puppet. The power-loader was a styrofoam suit. The alien suits were streamlined and cameras turned upside down to capture the frenetic and frightening movements realized in the film. Pure genius. Maybe you haven’t been keeping up on current events, pal, but we just got our asses kicked! They mostly come at night…mostly. When Hicks calls the dropship to pick them up after their disastrous first encounter with the aliens, they’re planning on loading up and flying straight to the Sulaco, right? Because, if so, they’re kind of leaving Bishop behind at the colony. Isn’t he also “an expensive piece of hardware?” Should they just leave him behind? The one really obvious glitch in the special effects that hasn’t been excised on the current Blu-Ray (other than the limitations created by the blue screens of the day) was the scene where Bishop shows off with the knife. Obviously the film was sped up to make it look like Lance Henrikson’s hand was moving faster than possible. When this happens, though, Al Mathews doesn’t slow down his nodding enough and it looks like his head is about to pop off his neck. The aliens are supposed to be smart, but it seems like the queen isn’t that great at math. We know the colony has only 157 potential hosts for the aliens, which means the queen has a total complement of 156 alien drones. We see (in the extended version) quite a few of them get blasted by the sentry robots to the tune of 990 rounds of ammunition spent, and later when they storm the command center via the ceiling crawlspace, several more die as Hudson and Vasquez spray the room with armor piercing rounds and grenades. In fact, when Ripley gets to the hive, there are hardly any aliens left there. Seems like grabbing this handful of hosts was a Pyrrhic victory for her majesty. Enlivened by a principled, charismatic one term Senator, in 2008 America elected a one-term Senator to inaugurate a bold, new era of progressive government to remedy eight years of Republican cronyism, corporate favoritism, and “endless” warmongering against an emotional state. What we got, of course, wasn’t quite what many of us expected. Instead of staking out progressive territory and then finding middle ground with an increasingly intransigent and arguably racist right wing, President Obama went to the middle as a starting position and then was forced further right for even modest legislative and policy goals. In short, with a compromiser-in-cheif we got a deadlocked government. So, I firmly believe that in 2016 we need to elect another one term senator. One who has already proven herself to be as much the anti-Obama as Obama was the anti-Bush. 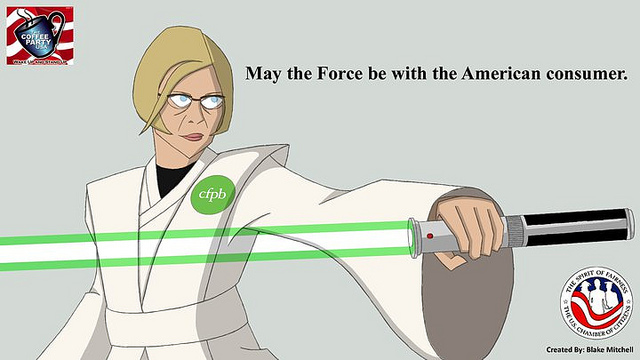 Senator Warren (hot damn, that feels good to say) has, not just supporters, but fans. That base of support for her ceaseless championing of the American consumer has earned her a place on the Senate Banking Committee, where she has asked the questions nobody else dared to during the financial crisis. For her, the enormous crime committed against the American people by our economic and political leaders is not just a piece of unfortunate history. She recognizes that the actors and set-pieces for this tragedy are still around, and we can still rewrite the script before there’s a repeat performance. Now, she has sponsored legislation to take President Obama’s move to cut out the middlemen for college loans one further. She has proposed extending the lowest interest rates–the kinds the Fed gives to, you know, banks–to students. The logic of Warren’s plan is astonishing only in that we, as a society, have been so conditioned to the capitalist status quo that we hadn’t all thought of it before. If economic activity is important enough to our society that we must foster it by offering lean interest rates to the banks, then the same must be true about education for our future leaders–surely that is as important as short term economic stimulus? We do want somebody like that to be president. That’s not to say that I don’t like it–I do, I’m a sucker for all things sci-fi, but that doesn’t make it worth writing about. Looking back, there are a number of science fiction series that I’ve watched pilot to finale and which have been duly stamped into my unconscious on many levels, but about which I must ask: what’s to say about them now? X-files? Well, I am tempted to write an extensive essay about how that show’s precipitous decline in quality because greedy executives tried to keep it alive long after they should have has made me skittish about any TV show and bizarrely grateful when a show ends without having had time to grow stale (I’m looking at you, Firefly), but that’s for another day. Star Trek? The original series is iconic and historically significant, but it also had various trips to planets based solely on which left-over sets could be reused on the Paramount lot. Hence we had the Nazi planet, the Western planet, and whatever planet had that same Yeti-looking thing over and over again. And the others? Well, Next Generation had some moments, but nothing resembling the kind of consistency you could generalize about. The rest are, well, pretty forgettable (not that I’ve forgotten, per se, but I should have). 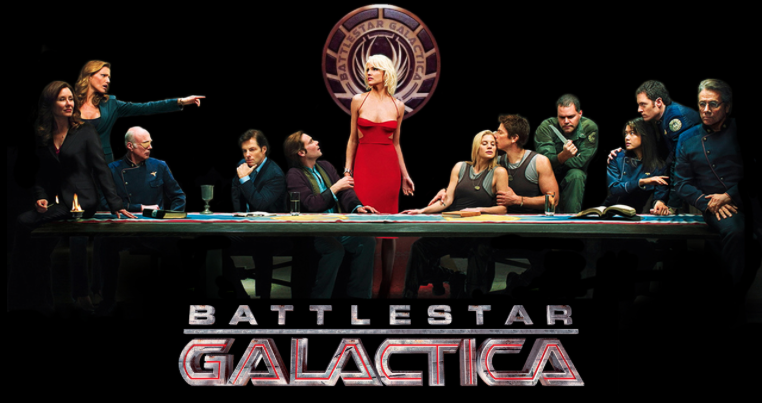 So there just aren’t many sci-fi TV shows worth talking about, but Battlestar Galactica is an exception. On one level, it physically pains me to praise this series because it is yet another product of the modern entertainment industry’s obsession with resurrecting long-dead (or sometimes recently sleepy) franchises through reboots. Battlestar is a perfect example of the inanity of this thinking. This show resembles the original 70s series in little more than name and general fighter-jet design aesthetic. Whereas the old series was overwrought space opera, BSG (as fans know it) was gritty and hard-nosed realism. Yes, realism. It’s a military and political drama that just happens to take place in space. This direction was bold and a real departure for TV sci-fi. Every space show that had come before it tried in one way or another to be fun–to be light-hearted entertainment. Whatever themes it might have been tackling in any given episode (and there weren’t always any to speak of) Star Trek was an adventure, first and foremost. BSG was different. In the wake of James Gandolfini’s death, a lot of people are crediting The Sopranos for paving the way for the current generation of gutsy cable dramas like Mad Men and Breaking Bad. That’s true enough, but it’s also true that without BSG, there probably wouldn’t have been space on that landscape for the likes of Game of Thrones and Walking Dead. Most other sci-fi TV also falls into mostly adventure-of-the-week story-telling. BSG, though, dealt with running plot lines much like the crop of TV dramas referenced above. What’s really noteworthy, though, are the allegorical dimensions and political themes running underneath the surface throughout the show’s four seasons. In this rendering, the twelve colonies of man are a pluralistic, democratic society that is ambushed by a monotheistic, ideological race bent on their destruction as recompense for past wrongs. On one level, this might seem like yet another piece of pop culture regurgitating 9/11 motifs the way that Japanese movies used to fixate on the destruction of cities post-Hiroshima. But BSG takes four years to craft its big message about the cycle of violence and the ultimate shared humanity of entrenched enemies (even when, in one sense, one side isn’t exactly human) and challenges every point of view along the way. There is no pat morality tale here, but there is one idea that resonates out of all the confusion of shifting alliances, twisted motivations, suspect moralities, and genocidal agendas: it is not enough to survive, one must be worthy of survival. BSG also pulled together an exceptional cast to create its dizzyingly broad cast of characters. The troop was led by Oscar nominees Mary McDonnel and Edward James Olmos as the leaders of the decimated human race. While some characters, like Apollo, languish in wishy-washy uncertain realization, other characters spring forward into sci-fi icons. When she first appeared on Big Bang Theory in her BSG uniform, my kids didn’t get who Katee Sackoff was, but now that they’ve been properly initiated (with hands over eyes for the racy bits) they recognize a geek goddess when they see one–or when Howard Wallowitze imagines one, that is. We also grin to ourselves when we see other alum of BSG, like Tahmoh Penikett (most recently in Man of Steel) whose marriage to Grace Park’s Cylon turncoat became an emotional core in the show. Many of these characters swing wildly through extreme situations throughout their years on the run from the dreaded Cylons. The changes they’re put through put me in mind of character critiques of Shakespeare. Shakespeare’s characters are wildly inconsistent, after all, so the question is: was the Bard lousy at keeping them consistent, or did he know human nature well enough to know that we all jig and amble and lisp? I’ve come down, late in life, on the latter side, and I give BSG the same benefit of the doubt. Finally, there are the baddies…who aren’t the baddies at all. Some of the Cylons are cheap CGI foot soldiers (still an improvement over guys in kilts with metal helmets like in the 70s show), but even those effects are too special to roll out every other scene. So in the new mythology of BSG, the Cylons have “evolved” into cyborgs who mimic human form. The enemy has become us, as much to best us as to infiltrate us. Though there are plenty of episodes that utilize sci-fi tropes differentiating the Cylons as “machines” and artificial beings capable of superhuman feats, at the core, they are human. They are fragile, almost psychologically broken beings, and their imperfections are as important to the themes of the show as the conflicts between the squabbling human characters. Initially, they nuke humanity out of resentment and rage, but by the end of the show, they have embraced their own humanity and (the surviving) Cylons merge with the human race, offering a tentative hope for an end to endless bloodshed and misunderstanding. From the beginning we were promised that “they have a plan,” and, though my faith wavered in the creator’s commitment to a long-term arc from episode one from time to time, there was still more than enough menace in the Cylon threat hounding the human characters to see the show through to the climactic battle in the final episodes. Okay, there are exactly two more of these kinds of retrospective geek meditations that I simply must do. Stay tuned. I am sorry for all the e-mails you are getting today. What can I say? I had a lot of silly ideas while doing laps in the pool this morning, so I have now posted three new fairly light-hearted examples of flash fiction and one earth-shatteringly important example of contemporary allegory–see if you can tell which is which! This is doubly odd because yesterday was a multi-post day, too. I’m not sure of the math, but if this progression holds then I believe that by next week, I will be posting more than fifty items per day…and by the end of July my posts will consume all known energy in the cosmos. Well, we can’t have that, can we? I’ve finished my sub-series on comic book movies and the ones that are left for the season (Wolverine? Really, again?) don’t exactly call out to me, so my sci-fi connoisseur posts should be dropping a bit in frequency. I must say, though, that there are a few titles I still must write about or else the entire series will seem incomplete, so stand by for those…unless you hate those kinds of posts, in which case, well, don’t. Sorry again for filling up your inbox–particularly with this post–but tomorrow should be relatively quiet, so you can take heart…unless, of course, I have another curiously potent burst of low-level inspiration like today, in which case, I’ll probably have to apologize again.